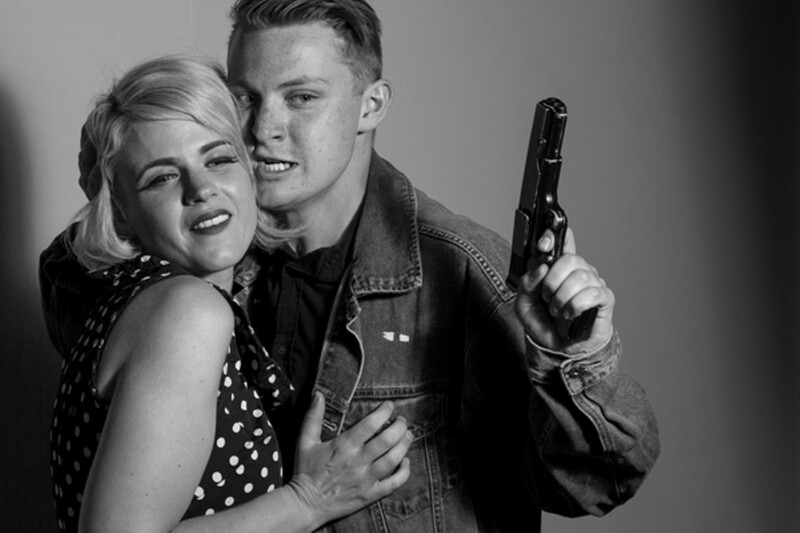 Sarah Coykendall and Michael Garrett McDonald play ruthless killers who love dancing in The Sadist. Impact Theatre's Splathouse Double Feature with The Sadist and Eegah! is many things — a film, a live performance, a re-creation of two real, cheesy, low-budget horror flicks from the Sixties, and a parody of those flicks. It's sort of Mystery Science Theater 3000-esque, but with theatrics in place of the humorous commentary. As a production, Splathouse involves the most mockable elements from B movies — the over-acting, the discontinuity of scenes, the crappy special effects, etc. — and combines them with a thespian's flair. While Splathouse's re-envisioning of two silly horror films is certainly tackled with eye-bulging aplomb, the rub is that they don't take it far enough. The first movie that Splathouse adapts is The Sadist, James Landis' 1963 psycho-thriller about three school teachers — Carl (Mike Delaney), Ed (Joseph Mason), and Doris (Cassie Rosenbrock) — whose car breaks down on their way to a Dodgers game. While trying to fix the car in a junkyard, they meet psycho killer Charlie Tibbs (Michael Garrett McDonald) and his simpering yet mute girlfriend (Sarah Coykendall), who doesn't do much except coyly giggle throughout all the bloodshed. 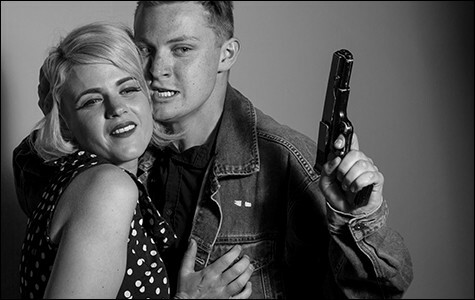 (The couple is based on the real-life criminals who inspired Badlands and Natural Born Killers.) What follows is an oddly slow-placed struggle between the teachers and the psychos, where all but one ends up dead, but not first without a ten-minute dance sequence involving groin kicks and ankle-biting. With all of its campiness and unnecessary dramatic pauses, The Sadist re-envisioned as a short play/film had its share of funny and delightfully random moments — most notably, schoolteacher Doris's weird phobia of chains, and Charlie slowly chugging an entire Coke before shooting his victim. But on the whole, the mini-play was underwhelming. It was bad, certainly, but not bad enough to be bad-good: Birdemic or The Room, it wasn't. Partly, this was the fault of the original film itself, which is generally lauded as a decent thriller for its time — low budget, B-movie status and all. Its rating on IMDb is a solid 6.8 out of ten. Plus, the film enjoys cinematography by one of the most influential Directors of Photography in history, Vilmos Zsigmond. In other words, the film was perhaps not very amenable to satirical reshaping as a condensed play. In order to succeed as such, The Sadist in play form would have needed far more blatant over-the-topness to draw attention to its zanier, WTF elements. Eegah!, Splathouse's second feature, does this much better. Based on the 1962 bomb directed by Arch Hall Sr. (Fun fact: His son, Arch Hall Jr. starred in both Eegah! and The Sadist), Eegah (Mason again) is a prehistoric, misunderstood caveman who is discovered near Palm Springs by two teenagers, Roxy and Tom (a naive, compassionate Coykendall and her relentlessly optimistic boyfriend, Garrett McDonald). When Roxy tells her dad (Delaney) about the giant, he sets out to find the creature and document its existence, only to be kidnapped immediately. The teenagers then attempt to find him, prompting Roxy to get kidnapped and sort of fall in love with Eegah. The ridiculousness of the premise lent itself to parody remarkably well (the film's IMDb rating is an abysmal 2.1 out of ten), and Coykendall, Garrett McDonald, Delaney, and Mason all shine in their respective, hackneyed roles. The opportunities for humor were rife, and live show directors P.D. and the Bug took full advantage of the film's circus-y overcompensation. Adding to the lampoonery of this horror-romance were stunning special effects that included a toy helicopter on a string and a padded box with a disconnected steering wheel in lieu of a car. The screening portions of the production, while perhaps ultimately unnecessary, were spot on, and Edwin Fernando Gonzalez captured the mise-en-scènes faithfully, down to the creepy black-and-white close-ups of The Sadist and Eegah's color-saturated California landscapes. And the cheesy props and amateurish acting all add to the production's entertaining spoofiness. All in all, Splathouse is a fun, if at times lightweight, riff on a bygone movie genre that lends itself well to theatrics, silliness, and lowbrow shock value.